LiveCycle ES Managed Services go Production! Adobe LiveCycle Enterprise Suite 2 (ES2) has now moved into a production environment! 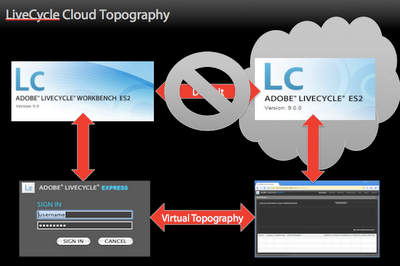 Using the moniker “LiveCycle Managed Services”, Adobe is hosting a set of web services that provides an alternative deployment model for most Adobe LiveCycle ES2 modules. It is offered in partnership with Amazon, the industry leader in IAAS (yet another acronym using the suffix “As A Service”; the “I” standing for “Infrastructure") cloud computing and leverages the power and security of the Amazon EC2 platform. I am personally not for using the acronym IAAS because anything that is concretely implemented on this scale is ipso facto infrastructure services (the same as I claimed about DaaS or Data as a Service). The cloud architecture is simple. It effectively uses a client side interceptor to proxy requests bound to a localhost address to a remote endpoint that proxies the services. Below is depicted a typical environment for development, however the runtime is essentially the same. Cloud computing has many advantages. First, by definition, the logical and physical network topologies no longer map to each other. This effectively allows for faster scalability. Adobe also puts 24/7 enterprise level support on this making it easier for small and medium sized enterprises to use for mission critical applications. Another advantage is that it costs far less to use the managed version as all admin tasks are shared with other users. Things like backups, monitoring and intrusion detection are done for you at a much cheaper cost. The full power of LiveCycle can be made available to your organization at a much lower cost. Labels: adobe cloud computing, Adobe LiveCycle ES, hosted services.